In my mind I had the image of a lake full of reflections, surrounded by snow covered mountains and clear blue skies above. My boat would glide forever with a single stroke, leaving me free to take the most wonderful and inspiring photographs I could ever dream of. “You must be mad”, “you’ve not been to Scotland in winter before then!” Were the comments I got when I excitedly announced my latest trip to colleagues. I’d checked the 10 day weather forecast and it all seemed fine. So excitedly I got in the car with Al, for the 400 mile drive up to Scotland. We were heading for Loch Ericht, right in the heart of the Scottish wilderness. There was a little bit of snow on the hills to start off with but as we made our way through the highlands and darkness fell, the snow started to fall heavily. By the time we reached the Drumochter Pass on the A9, visibility was poor. The car was starting to slide all over the road and things where getting quite scary, when a faint light shone through the blizzard and the letters B&B appeared. It was a bit like one of those corny movie moments when help appears from nowhere but just when you thought you where safe a huge monster comes out and eats you! Thankfully we saw no monsters but we still had 200 meters of deep un-snowploughed road to get through before we finally reached the warmth and safety of the Balsporron Cottages B&B. We were greeted by Ann and Phil who made us feel right at home in front of their real log fire and even made us a very welcome hot meal. After a lovely night’s sleep we were up early, ate breakfast and headed outside to an incredible snow-covered landscape. Everyone helped to dig the car out and once back on the A9 the road was clear and we were only a few of miles from Loch Ericht itself. Ann kindly printed out an up to date forecast for us which took us slightly by surprise. 35mph winds with gusts up to 70 and snow was forecast for the next two days and I guess if we’d had any sense we would have turned back then, but we’d driven so far, taken time off work, spent all that money on petrol and there wasn’t a breeze in the air, so we decided to carry on. We left our car just behind the Petrol Station in Dalwhinney where the guide book suggested and loaded up my brand new Wenonah Prospector canoe. We then made the 600 meter portage down the lane under the railway bridge, through the barrier and down to the lochs edge. I couldn’t believe how easy it was to drag a fully laden boat over snow by myself. At only 14.5miles long, I’d given us a couple of days to complete the round trip of Loch Ericht with the highlights being a nights stay at the famous Ben Alder bothy and a visit to Bonnie Prince Charlies caves at the furthest end. The sky was grey and it was bitterly cold but even at the lochs side the wind was barely noticeable. 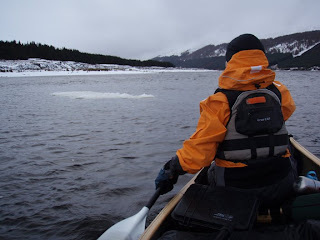 So off we went, all wrapped up in the latest winter gear, paddling past huge lumps of ice floating in the water, hoping to reach Ben Alder by teatime. We’d only been paddling fifteen minutes when we passed the first headland and the full force of the weather hit us. It was blowing a hoolie out there on the main part of the loch and it took all our strength just to stay head on to the waves. Being sensible we should have turned back there and then but we didn’t. As the weather got even worse and we started to tire we realised that we had no choice but to continue as both sides of the loch where by now, too steep for a safe get out, with such big waves breaking on them. The sun was disappearing fast behind the mountains and the temperature plummeted further. I have to say, my new Wenonah prospector (quick plug) handled amazingly in what has to be the worst conditions I have ever paddled in. My old boat would have been swamped in no time but this new baby just glided up and down the waves with astonishing stability (plug over). It was after 4 hours of battling through hellish conditions we finally found a beach we could land on. It was starting to get dark and I had an uneasy feeling inside, things where not looking good. Al got out of the boat first and soon realised there was no way we could get a tent up on the rocks where we’d landed. Further up there was some grass which looked perfect until we stepped on it. The thin layer of ice it was growing through cracked and we were stood in 5 inches of water. 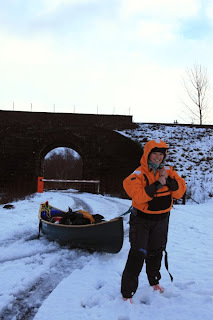 The sheer hard work of paddling had been keeping me warm in what was now below freezing temperatures. But now I’d stopped I desperately needed some shelter. We found a spot on a slight incline where our feet only sank about an inch and decided there just wasn’t time to look for anywhere else. My face was raw, my feet were numb and my whole body was hurting and aching from being too cold. All I wanted to do was roll up into a ball, shelter my body from the bitter wind and close my eyes. For a split second I thought ‘gosh we might not get ourselves out of this’. Then something inside kicked in, and with a sudden rush of adrenalin, my frozen paddling mittens came off and we fought like hell against the gales and the failing light to put that tent up. All I could hear in my head was my heart pounding, for that single moment nothing in the world mattered more than getting that tent up and somehow, we did it. I have never felt so focussed on anything in my life. As the final peg went in, almost like a cruel joke, the wind dropped. Then as I looked up around me into the fading light, I realised we were surrounded by deer. There must have been 200 of them, mainly stags, all watching as we finally took refuge inside our tent. It was a reflective evening in the tent that night, with neither of us knowing quite how we’d let ourselves get into such a dangerous situation. Thank goodness we’d bought the tent as a back up in case the bothy was full. We’d at least done something right. As my body warmed up I realised I’d quite badly pulled the muscle in my left forearm and even Al was feeling pretty sore in his shoulders and neck from 4 hours of hacking. The following day we woke up to find everything frozen. My gloves, the toothpaste even the rice pudding I’d decided to cook for breakfast was frozen solid in its tin. The cold was affecting our gas cooker too which was barely alight and certainly couldn’t cook anything. Luckily we had a spare trianga, meths stove with us which although classed as a bit old fashioned these days, worked a treat. Outside the windchill temperature had been -14 degrees Celsius. The wind was strong but not gale like, like the day before so we had another decision to make. If I didn’t make Ben Alder Bothy, with all its history of ghosts and ghouls and didn’t climb the mountain to see Bonnie Prince Charlies cave, what would I write about? We got out my GPS and we’d only managed to paddle 6.9miles the day before. We usually paddle three times that distance in that time and the weather was slightly better so we decided to give it a go. So with another great decision under our belts we decided to leave the tent where it was, paddle the 8 miles to Ben Alder Bothy, get the photo’s I needed for an article then sail back, have a late lunch at the tent, pack away and sail the 6.9miles back to the beginning. It was so cold though, even with all the high tech kit we had on, I still wasn’t warm. I even ended up putting on the £2.99 last minute back-up balaclava I got from the garage in Capel Curig on, over my scull cap. I have been umming and arring about whether to submit the photo of me wearing this ensemble and I’ve been persuaded too against my better judgement, just remember it was really really cold! Anyway, off we set towards the Bothy. The snow covered mountain Ben Alder towered above us but offered no shelter from the strengthening wind. My forearm was agony and I found it difficult to paddle on my left side but we still carried on. The waves got bigger, the wind got stronger and I was exhausted after just an hour. Then a snow blizzard started and I just couldn’t do anymore. Al was gutted that we’d come so close and I just couldn’t find the strength to paddle another stroke. He tried to carry on alone but the wind was too strong so reluctantly with only a mile to go he turned the boat around and sailed back to the tent. As I sat exhausted and motionless in the boat letting the sail take us back, I was totally unaware the effect the cold was starting to have on my body. My toes were numb but that had happened the day before but, about an hour later, when we’d finally reached our tent, I tried to get out of the boat I couldn’t straighten up. My body felt rigid. I tried to ask Al for help but my speech had gone all slurry, this really scared me. When I did get back to the tent and laid down my body started to shake uncontrollably. It only lasted a few minutes and I was then ok but, its frightening to imagine what would have happened if we’d stayed out on the water even a few minutes longer. By 2.30pm we were both in the tent wrapped up in our sleeping bags sipping hot sweet drinks as a freezing blizzard howled outside. We should have been back at the car by now and I was worried the guest house I’d booked for that evening might call emergency services if we didn’t turn up so I routed through my dry bag and found her details, only to see that I had her address but no telephone number. My mobile reception was intermittent so I texted my friend the address and prayed he would find the number, before a big helicopter came in search of us. Luckily he found it and a quick call later everything was fine. I soon fell asleep and incredibly 17 hours later I woke up. I do like the odd lay in but that was pretty impressive even for me but I guess my body must have needed it. It was 9am on day 3 and as I looked out of the tent I couldn’t believe my eyes. The sun was shining. The loch was flat and I was surrounded by beautiful snow covered mountains. We’d not seen a top of a mountain since we got there; the landscape was breathtaking. I could finally get my camera out and take some photo’s. With such lovely weather we could have easily paddled to the Bothy, seen the caves and paddled all the way back to the car and still have hours to spare but my body had had enough and we finally made the first sensible decision of the trip and paddled straight back to Dalwhinney. Things could have turned out so badly but through sheer luck rather than judgement they didn’t. My sense of adventure has gone up another few notches and I’ve certainly leant not to under-estimate the British weather. But my head is filled with incredible achievement knowing I paddled and survived such harsh conditions. And now I’m paddling through some of the most magnificent scenery I’ve ever seen in my life. This is the bit I’d dreamed of and I guess it’s made even more spectacular by what we’d endured to get here.